Emma’s mother is brain dead and her body is being kept alive by machines because she is pregnant. Emma doesn’t agree with her stepfather’s decision to keep her mother alive so that the doctors can deliver the baby in a few months, and she is unable to move on and accept the fact that her mother is dead when she has to stare at her lying in bed day after day. When she meets Caleb Harrison, a notorious bad boy who is always in and out of trouble, she is surprised that she is able to connect with someone so different from her. What she finds is that Caleb is not just the bad boy he seems to be, and he may be someone that can help her get through her grief. This book presented such a difficult situation and one that I cannot imagine having to cope with. It’s terrible enough that Emma has to lose her mother at such a young age, but to not even be able to properly deal with her grief is even worse. Part of her still hopes that her mother will wake up even though the doctors say she is brain dead, and it is even harder to accept the fact that she is truly gone when she is still technically alive. Emma even somewhat hates the baby because she blames it for her mother’s death. I can’t imagine what kind of choice I would make if I were placed in that situation. It is hard to be mad at Emma’s stepfather for wanting to save the baby, but it also is kind of messed up that Emma’s mother is just being kept alive so that the baby can develop. It’s a very tough issue, and I can completely understand why Emma reacted the way she did–hating her stepfather and the unborn baby. When she meets Caleb, who has his own family issues, the two of them are able to help each other through their problems. They are two of the least likely people to ever get together, but their issues help them to connect and understand each other, which leads to a really great relationship. 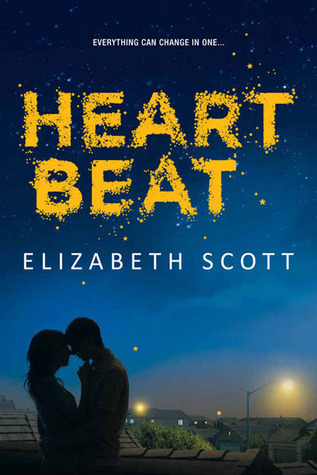 Overall, Heartbeat was a beautiful novel about a very controversial issue. Scott did a great job of handling this issue and created a really incredible story. Heartbeat will be released on January 28, 2014.